Your TV’s mounted on the wall, right? Chances are, it is. That’s the whole point of a flat TV… it mounts on the wall where it stays out of the way. The problem is that sometimes cable management can be a problem. A lot of times, the HDMI ports on the back of the TV are inconvienient. Sometimes they even make it hard to mount the TV against the wall. I’ve never understood why manufacturers would do that. But they do. Luckily there is an option. These Vericom pivoting HDMI cables let you bend the head of the cable 90 degrees in either direction. This makes it a lot easier to snake those cables around just where you want them to be. It also keeps them from sticking out the back so far that your TV can’t mount flush to the wall. These aren’t just cheap cables, either. They are high-speed rated and will work with any HDMI 1.3 source. That’s pretty much any HD media player, cable box, or streamer. 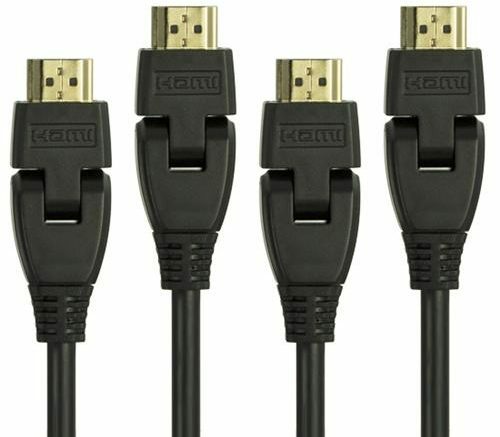 And you know, the best part is that you get four of them for a very reasonable price, less than you used to pay for one regular HDMI cable. Basically it’s worth buying these now and figuring out how you’re going to use them later. You’re not going to find these cables in stores, and believe it or not I just checked Amazon and they aren’t there either! It’s a Solid Signal exclusive and it’s a great price to boot! Look, I know this all sounds really salesy and no one likes that, but I personally use these cables and they work. You never know when they’re going to come in handy, and in all the years I’ve used them, I’ve never had a problem with the pivot head or any other part of the cable. So, why not give it a try? Shop now for Pivot Head HDMI cables at Solid Signal!